I’ve done some cool things in my life. I graduated from UCLA. I had a brief conversation with will.i.am. which resulted in him hugging me. I’ve held onto a mechanical bull for an unprecedented amount of time in front of all my friends. I’ve hiked to the top of Half Dome and I’ve even been skydiving. But you know what I’ve never done? I’ve never been to Idaho and I’ve never dug up a potato. Well, life is about to get a little bit cooler. Thanks to the Idaho Potato Commission I’m in Idaho to not only dig up a potato but see the Fall Harvest in full swing. Joined by a group of super talented bloggers, who love potatoes just as much as I do, you can follow our adventure all week long on Twitter and the hashtag #idahoharvest. Julie Deily over at The Little Kitchen doesn’t want to sound pretentious, when she declares these are Perfect Mashed Potatoes. “Well, Perfect Mashed Potatoes for me,” she clarifies. 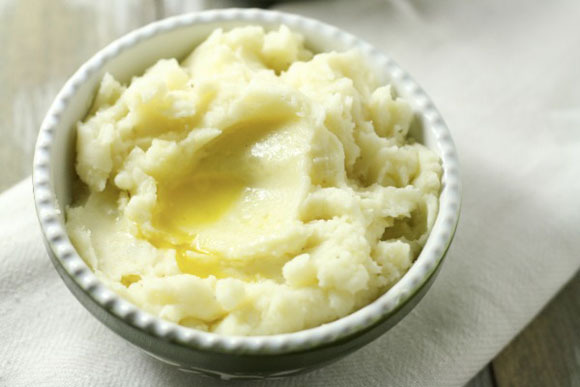 “After trying many recipes and trial and error over the years, I have found the technique that works for me.” Julie also reveals her secret ingredient that makes her Perfect Mashed Potatoes even more perfect for Thanksgiving. Did you know that September is National Potato Month and Latino Heritage Month? 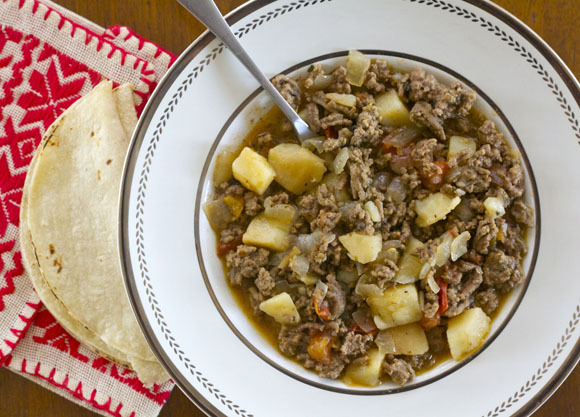 Fellow YouTuber, Nicole Presley of Presley’s Pantry has a spicy Picadillo Video Recipe to celebrate both. 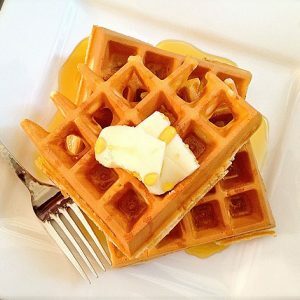 Nicole proudly shares this cherished family recipe and shows off some mad Mariachi skills. Watch Nicole’s video and subscribe to her channel on YouTube! Just when you thought you’d seen and heard every version of the viral meme phenomenon that is Call Me Maybe, Meagan Micozzi over at Scarletta Bakes has put a spud-spin on it with her Chihuahua Twice-Baked Potatoes. I don’t know about you, but I can’t wait for her version of Gangnam Style Gnocchi. I figured Patti Londre of Worth the Whisk was a bit of a gagster, I mean she comes from a family of seven. Practical jokes on loved ones are the only way to keep your sanity in that kind of herd. I know this because I come from a family of eight. 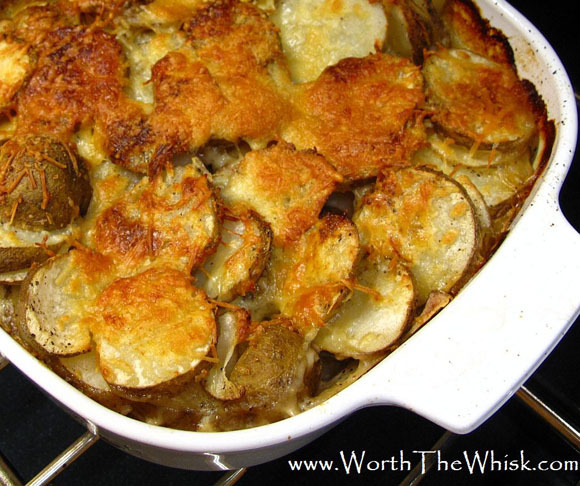 Although Patti credits her Mom, Gloria, with these delectable Scalloped Potatoes, her Mom will point out that this is not her recipe. And about that practical joke? 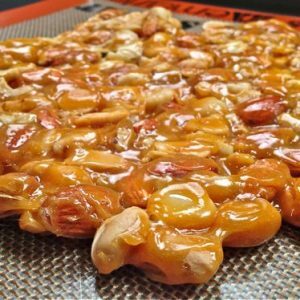 You’ll just have to check out Patti’s blog… It’s way better than the salt in the sugar bowl prank I got crucified for as a kid. 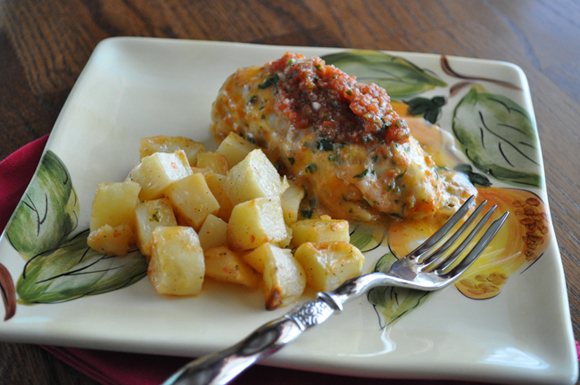 Jessica Reddick of My Baking Heart is, “always on the lookout for filling dinner dishes that are easy and quick to get on the table during the week.” And she didn’t have to look much farther than the good ol’ Idaho Potato Commission website for this flavor-packed Cilantro-Lime Chicken & Idaho Potatoes. Leaving no detail untold, the lore behind Lamb Champvallon only makes you long for more. And you’re in luck, Greg’s first book, Savory Pies will be out in November. Pre-order on Amazon before the holidays are history. Although I can’t imagine Marla Meridith of Family Fresh Cooking being a hot dog kinda Mom, the fact that she describes her roasted Teeny Tiny Potatoes as having a skin that “pops like a hot dog when you bite into it,” has me convinced they must be everyone’s favorite. 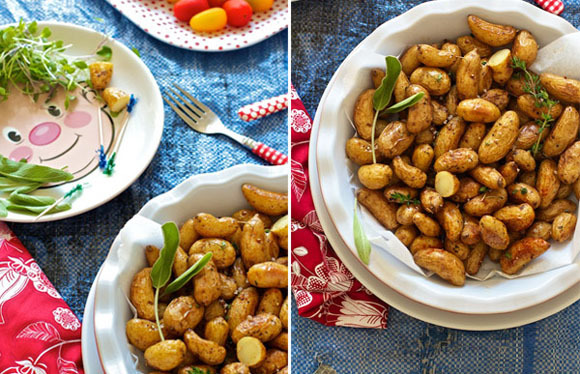 Marla touts these tiny taters as the modern french fry; and the greatest part? She has plenty of ideas and beautiful photos to show you how to get them into your kids lunch box. I totally smell what Jessica Segarra of The Novice Chef is cooking. You know those foods you marvel at in pure disgust as others swoon with glazed eyes and drooling, wagging tongues? 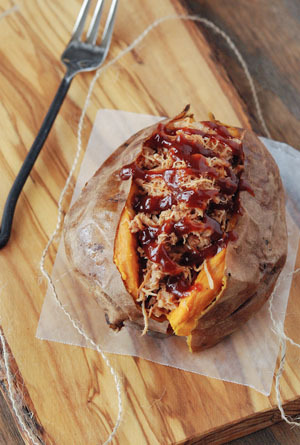 Jessica shares her new-found adoration of meat stuffed potatoes with Pulled Pork Stuffed Sweet Potatoes. And even though they don’t grow sweet potatoes in Idaho, this recipe was just too scrumptious looking not to share. Besides, bake up an Idaho Burbank Russet and you’re still in meat-stuffed-potato heaven. 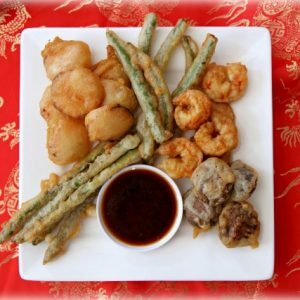 Rachael Hutchings, a Japanese Food evangelist by way of La Fuji Mama, shares a recipe for Chef Hiro Sone’s Niku-Jaga. Not familiar? Not to fear. 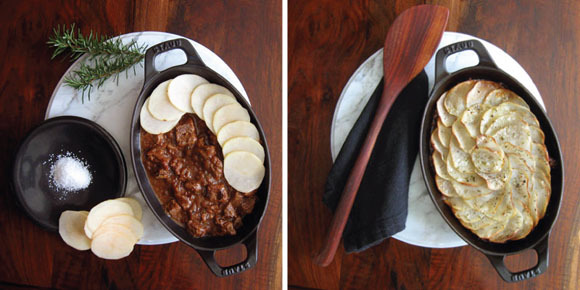 Rachael demystifies this comforting and filling stew made of meat, potatoes, and mushrooms. 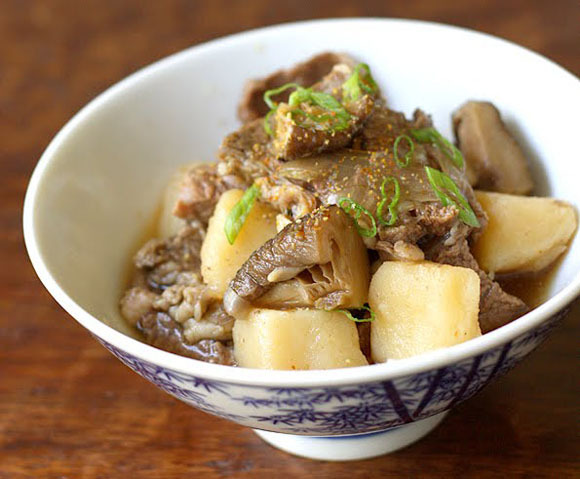 Niku-Jaga sounds like the ultimate cool weather meal, when American-style meat and potatoes just don’t seem nearly exotic enough. I hope you’ll check out all of these cool blogs and bloggers and follow us all along as we experience Idaho Potato Fall Harvest 2012! LOVE!! 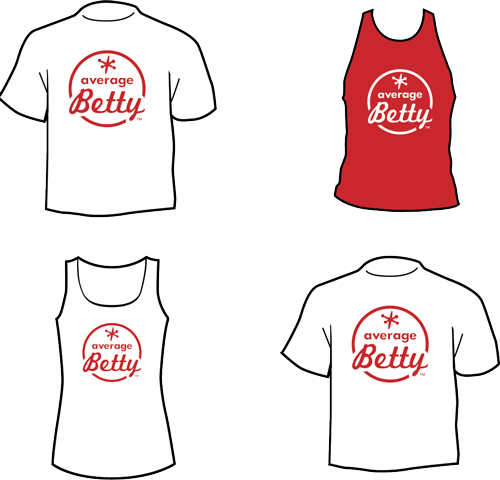 Spudtacular, as always, (Not So) Average Betty! So fun to pick potatoes with you in Idaho! 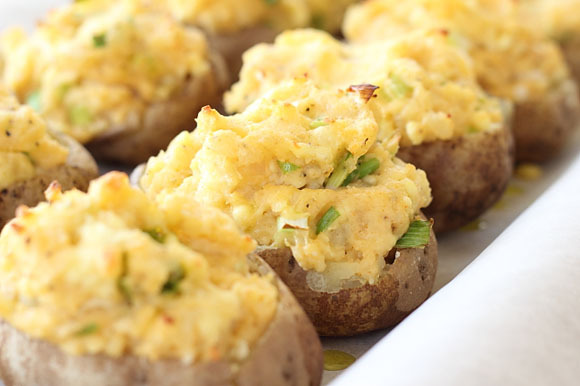 What a spudtastic roundup of great dishes! Thank you! I see you will be at the PMA in Anaheim…would love to connect. Please stop by Booth # 3984 – we can talk spuds. Or if another avenue works for you…let me know!